So, I headed for my sewing room and did a bit more cleaning, ensuring the dirt wouldn't interfere with my sewing. Once satisfied, I went looking for my pile of " blocks in waiting." Those are the "I've got to piece the blocks to make a top" pile. Keeping the quilt in blocks was easier for me to store than a flimsy. I use the past tense as this will no longer be the case once I have my new longarm! I'm so excited! Tah dah..... Of course I had to sneak in a bit of the new floor! lol I started this quilt back in October 2007. The pattern is from the McCall Quilting magazine . As you can see, the quilt is kitty approved! Allow me to introduce Princess Stella. When you meet her, you'll see that her name suits her. I also worked on the pink and brown quilt, In the Pink, from Buggy Barn. I have the center pieced and have the borders to add on. I'll post a picture once it's at the flimsy stage. Have a great day everyone and thank you so much for stopping by! This flimsy is also approved by me *LOL* It is beautiful. I hope you will get better, I was reading about these sciatic nerves and it seems to me that it is pretty serious, you have to take care. That quilt looks so pretty on your beautiful floors you just might have to make it a floor quilt and then dare anyone to step on it. Isn't it great when things start coming together after a time of disorder. Your quilt is looking so pretty. Good luck with the sciatic nerve! 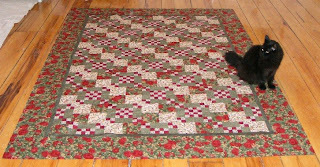 Decorators tell you to 'group in threes' You've got it - wood floor, quilt and kitty *s* They all look great! oh that is going to be a great quilt to start quitin' on!! I love the pattern you have only complimented it further with your wonderful selection of fabrics.. make sure you get lots of rest.. that will help with your physical problem.. i know easier said than done. Beatiful job on the quilt. Doesn't it feel great to finish something? It gets my approval as well. Your quilted turned out gorgeous and you'll have it quilted very soon...that's so exciting. I don't know anything about the sciatic but it doesn't sound like fun...take care of that. Your quilt top is beautiful, and so is the new floor :) Hope you feel better soon! Wonderful quilt on your pretty floor. and Kitty approved? Who can do better than that? ?